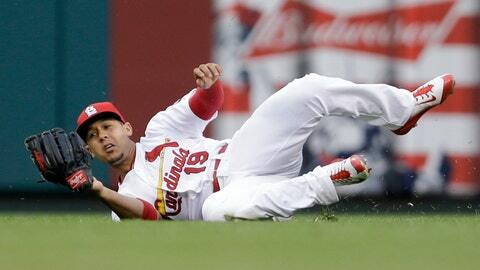 Jon Jay returns to the Cardinals after his second DL stint with a wrist injury. At least one of the St. Louis Cardinals’ wounded veterans is ready to play. The Cardinals announced Friday that they have activated outfielder Jon Jay from the 15-day disabled list. Jay, 30, who was placed on the DL for a second time this season on July 1, most recently missed 57 games due to a left wrist stress reaction. The left-handed hitting Jay was sent to Triple A Memphis on Sunday on an injury rehabilitation assignment, and in four games with the Redbirds he batted .385 (5 for 13) with one home run and two stolen bases. In 57 games prior to being placed on the DL, Jay batted .223 with two doubles, one triple, one home run and 11 RBIs for St. Louis. Jay, who had wrist surgery last offseason, spent time on the DL earlier in the year (May 11-29) with left wrist tendinitis.